Christmas means many things to many people these days! New, well-marketed traditions are here to stay whether we want them to or not, but it is up to us as individuals to continue to live our lives how we want to, true to our personal life values rather than feeling pressured into keeping up with the Jones’. One of the most wonderful aspects of Christmas, is that it‘s often a time when families make the effort to come together. Needless to say, when someone you love is then absent, for whatever reason, the stark reality hits you during this time of ‘togetherness’ like a knife through the heart. It feels like there is no escape for us, music in supermarkets pound out “All I want for Christmas is You”, School Nativity plays are cast with one less Shepherd, the empty stocking lies in a box, never again to be hung out for Father Christmas. It has, for us, now become a time of year, where we have to pull out all the stops to create a magical and hopeful environment for Jesse and Flynn, but that does mean supressing our building emotions of desperation and loss. I can only imagine that this must be the same for a great number of other people who are not ‘living the dream’ at Christmas time and our hearts go out to you. I recently saw two Christmas T-shirts in shop windows, one which said “I Want it All”, and the other “Do Nothing this Christmas”. These are certainly not the values we wish Jesse and Flynn to grow up with / nor the ones Skye held. As a family, we have our goals, and we cannot lose focus until they are reached, but we would never want our friends and supporters to feel we were pressurising anyone into our cause. I say this on the back of a school ground conversation I had with a mum the other week where she was exasperated by "yet another charity day", and the hassle of having to find a Children in Need outfit and to donate £1. I don’t suppose I was quite the sympathetic ear she had hoped for, as I have always felt it incredibly important for schools to promote a ‘caring for others’ attitude that we wish our own children to adopt, and I for one feel glad when a fun event can be coupled with doing some practical good! The money for bringing about change comes from these very type of events. The amount of luxury purchases made at Christmas just highlights how we can all find a bit of spare change if we are motivated to do so. What Andrew and I have discovered over the past two years is that fundraising is a tough gig! It takes an inordinate amount of energy, courage and bloody mindedness to keep things afloat and we would like to take this opportunity to thank each and everyone one of you who have stood by us in one way or another most sincerely. We very much hope that passionately sharing our new found knowledge, of an area which has been neglected for so long, sharing Skye’s humour, good natured spirit, and will to help other children, is what drives you to continue to walk with us, especially at this difficult time. Please don't ever stop thinking and talking about Skye, we love seeing his name included in Christmas cards. It means so much! We would like to share with you a video which we have held back until now as we were worried some may find it distasteful but it was a very true to life snapshot of how we all tried so hard as a family to keep silliness in our hearts and minds in order to enable Skye to giggle and laugh just as a child should do. We hope it makes you laugh too this Christmas…. My heart goes out this time of year, to all the mums having to hand over their precious children into the care of ‘big school’. We have all summer together, willing the date to get nearer, to be able to field some of the “why” questions, desperate for more time on our hands without having to be the soul provider of entertainment, knowing they will love making new friendships, devour new information and begin their journey of independence and growth. Why then is it so incredibly hard when that day finally arrives? Of course there are the obvious worries about how our children will cope; Will they remember where the toilets are in time? Will they have a happy day and meet a nice friend? Will they like the cooked dinner and eat something? Will they be brave enough to speak up if they need something? Add to that a great big dollop of selfish feelings about how we feel. Oh come on, its true. I hate this defining moment when you know your child is growing independent and will ultimately leave you to discover a life for themselves and of course that is what I will encourage every step of the way but it doesn’t make it less hard. I feel I owe Jesse a lot. What he has had to witness and cope with for over half his life now has not been the carefree, innocent, happy and exciting world I wanted to create for him. One day he was happily playing with his big brother in the garden, the next, a life separated from us all having to live with Granny much of the time and hospital visits ending with his inevitable howls echoing the corridors when it was time for him to leave. Jesse has been deprived the social life he craves. He is desperate to make friends with children his own age and I have made it my number one priority to make sure he has my full support. I have been very proud of myself and tried to blend in with the school parents, performing my best 'jolly' persona to date. "Smile", I tell myself every few steps. Walking to school each day with Jesse (who is still somewhat reluctant), I get flashes of Skye constantly. Memories of his excited face when we bought his new school shoes and writing his name in his brand new book bag all come flooding back. Seeing the older children running to school with their older siblings, knowing that Skye should be with us, holding Jesse’s hand or bumping him into hedges and playing tag on the way in. My heart is so heavy (smile). Jesse feels it too and while I believe he enjoys making new friends and comes running out at the end of the day with a big grin on his face, each morning however he gets very worked up at the thought of leaving us for a whole day. He said he wished Skye could be at the school with him. Skye, (with my help) has been writing Jesse little notes and leaving them in Jesse's shorts pocket for him to read at school to make him feel less alone. Please tell me it gets easier?! To finish, I would love to share this snap of Skye on his first day at school where we visited his class just for a short time. He boldly stuck up his hand, insisted I march him to the front of the class where he wanted to do demonstrate the purpose of his school swimming hat. “It goes on like this,” he said “and it keeps your hair from getting wet in the pool, well, it would if you had any which I don’t, ha, ha.” I will never forget it – what an amazing attitude. Jesse has already seemed to have captured the hearts of many of the girls in the class so he must have picked up a few tricks from his big bro!! It has been a happy day today. Awoken by Jesse (and Skye) telling Flynn the significance of the day and he just grinned as he always does. Skye still features heavily in Jesse’s make believe world and he is often telling us that Skye has hopped down for a play. I don’t worry about this as Jesse is an incredibly sociable chap and had no problem making live friends too. Andrew and I always find ‘special days’ some of the hardest to cope with but I am getting better at hiding what I feel for ‘the greater good’ and of course determined to make each day as good as I possibly can for J and F.
For anyone wanting to know what this is… well it is the aftermath of a cake smash! It all came about because I was telling Jesse how Granny had made me a telephone cake when I was young and I had picked up the receiver to try to make a call. He thought this was so funny and said he thought Flynn would definitely try to pick up his ‘ball’ cake. Not wanting to miss a photo opportunity, we nipped to buy a piece of plexiglass, placed the cake and Flynn on it then snapped away. You really must try it – so much fun! Why the plexiglass you may ask? Well not only is it supposed to contain the mess, (it didn’t,) but gives a beautiful reflection so little grubby feet and crums of cake are highlighted in the glass which makes for a stunning photo. Flynn was a little confused at first weather to tuck in or throw it but did repeatedly say the word “bawll” so certainly knew what it was supposed to be. He is obsessed with all things spherical and had a good day surrounded by balls of all shapes and sizes. I had fun too, I feel very lucky to have such engaging little people to share my time with. Now all I have to tackle is Jesse’s 5th Birthday in a couple of weeks, which he has announced he would like themed on ‘minitaure’!! Well at least the cake should be easy!! Last but not least, will be celebrating the birth of our dear Skye, who would have been eight years old on 5th November. This year we have decided to host a Firewalk Event and celebrate Bonfire Night in a rather special way. To find out how you can join in or sponsor us, check out the Firewalk page of the website. Sweet Birthday Dreams Ball Boy! Three years ago today my little boy was sick in the morning for the first time. For the rest of the day he was right as rain. I re-live that day over and over again, thinking I should have known somehow that there was something very wrong. Skye was diagnosed with acid reflux and was treated for this mis-diagnosis for two weeks. It was only due to seeking another GP's opinion and the fact that we were becoming worried that he wasn't improving, we insisted upon seeing a specialist paediatric consultant at our local hospital. Skye was diagnose fairly quickly but I have heard time and time again that children were not being diagnosed until they arrived at hospital with very sever symptoms at A&E. He did not suffer from headaches and I remember telling him to "look ill" while we were waiting in the doctors surgery as I was worried we wouldn't be taken seriously. Brain Tumours are the leading cause of cancer deaths in children, and the UK is slower than other countries at spotting the signs. We need to change this and by providing practical resources to help parents and doctors I hope this will go some way to save and improve lives. I am really not intending to scaremonger, just to act as a reference and to inform parents and professionals what to look out for as it has been understandably playing on my mind today. 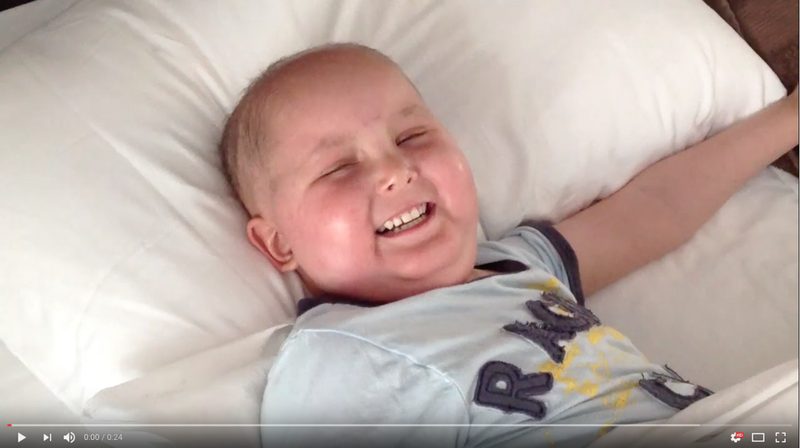 As you can see from the video below just a couple of week before Skye was diagnosed, he was not a child who looked like he had a deadly tumour lurking and growing at tremendous speed. The irony of the children's nursery rhyme Ring-A-Ring-O-Roses, makes me roll my eyes and shake my head every time I watch it but Jesse loves to watch himself having such innocent fun with his big bro so we thought we would share it with you to enjoy too. HeadSmart is a campaign which is aimed at educating parents and GP's in the hope that it will will save and improve lives. If you would like to find out more information please visit www.HeadSmart.org.uk (Symptom cards can be requested for GP surgeries and local Schools). If your child has any ONE of these, see your doctor. If TWO or more, ask for an "urgent referral". If you are reading this particular blog post then I have had the courage to publish it rather than just keep it hidden away. I may just need to rant, but I was so upset today. I am glad in a way because it has made me have a long hard think about why I take comments about “moving on’” and “deserving some happiness” so badly. They are intended to comfort, but for me have the opposite effect. I am not in the least bit surprised that people who pluck up the courage to talk to someone who has suffered some kind of horrific event get nervous and perhaps come out with well meaning clichés. I would firstly like to personally thank those people for having a go, you hearts are quite obviously in the right place. The problem is, trying to enforce someone to think positively who is still in shock and feeling such raw emotions will sadly only serve to direct their rage at you or themselves (I am the latter). Today had been a good day. When I say good, I should clarify what this feels like. Have you ever skipped a meal, and felt so hungry that although you can still function, conscious or unconscious, there is something nagging away at you constantly? It distracts you from what you want and need to be doing. A feeling that makes you edgy, with a short fuse and actually possibly even crazy until you have fed the hunger and returned to ‘normal’. The problem with grief is that there is no snack, no meal great enough to calm the heart and the mind so it is there, always, a constant feeling you have to learn to function with as best you can, but always lurking even during ‘good’ times. I felt joy when I took baby Flynn and Jesse for a walk to some local woods. It was a simple and peaceful time with nature. Jesse is such good company, as Skye was, and we chatted much of the way. I encountered an overwhelming feeling of wanting to give him the life I had dreamed of for Skye and had a rush of feeling brave enough to take him to watch Daddy umpire a cricket match at school later in the day, remembering how much fun Skye had had, as a four year old watching the big boys and serving the half time orange slices. After a Charity appointment I had to keep, sun shining, I joined Jesse pitch side and started throwing him some overs. It wasn’t long before I got ditched by Jesse, in favour of the ‘big boys’ who were obviously more cool to practice with. Flynn and I sat playing, minding our own business when I was joined by some other spectators. The conversation should remain private but although I felt I had had a very constructive day for the family and for the Charity, I must have ‘dropped the ball’ at some stage during the conversation because the phrase “you really deserve some happiness” and “one mustn’t live in the past” were said. I usually attract these comments more if people sense my sadness and respond by trying cheer me up I suppose, so in public, I try to sound cheerful as best I can to avoid these kind of comments. I used to be a ‘fixer’ too, a glass half full person, and I would love to still think like that but I have been changed. When someone says to me “it is time to move on” or “one can’t dwell on the past”, I think the only person actually benefitting, is the person saying it because it makes them feel better, willing to see you happy again. It is very natural to want to help ‘fix’ someone who is in pain but this is NOT the way to do it. It takes as long as it takes to heal and maybe I never will. How about this for a late night analogy - allowing a fragile egg to stay safe, warm and away from danger so it can hatch and a chick emerge, able to walk by itself is surely much better for it than rolling the egg down a hill because it will get from a. to b. faster but most likely crack on the way? Back to the Cricket - as you can imagine, I smiled, didn’t reply and politely made my excuses to leave. I took three wrong turns on the way home and burst into floods of tears when I made it back to the sanctuary of our home. Of course, I know I am over sensitive and I project what I think others may think of me far, far too much, but I take these comments as an indication that I am failing to do what I ‘should’ be doing. I really am trying to be a better person and I disagree with the saying “put the past behind you” because the past is what shapes the future good and bad. Every day I fight internal feelings of such hopeless loss and pointlessness of living but actions speak volumes too. I am trying so very hard to bring about positive change with our Charity and it takes a massive amount of time, energy and effort to rally supporters to help with fundraising events and encourage people to engage with Blue Skye Thinking. I am not sitting at home, withdrawn and cut off from society however appealing that is. I am fragile however, and have every right to be, because I defy anyone who could watch their own child die in their arms cope any better than us. Let us be sad when we need to be sad –please. Support us but don’t try to ‘fix’ us. We all know the saying ‘one gets what they deserve’. Of course no one would ever suggest that Skye ‘got what he deserves’ but saying to us we “deserve some happiness” always makes me feel upset, guilty and angry. I have come to the conclusion that actually no one "deserves" anything, good or bad. We can work hard and strive to achieve goals or adopt a more passive approach in life, neither being right or wrong. I still believe in being pro active, but sometimes life events unfold that are out of our control and are certainly not a case of whether we deserve it of not. What do you think? Perhaps in future, if you find yourself wanting to say "you deserve...." to anyone who is grieving for a loved one through death or even for the end of a marriage, try replacing it with “I would dearly like you to be able to find space for some happiness in your heart”. There is a video with this blog post - view by going into your browser. ***SOS*** I still have excess frozen stock which I need to shift at amazing prices! Please can anyone contact local clubs (Rugby / Footie clubs, groups or for your own use?!) If we can sell it, we raise our profit by alomst £1,000. 18 x boxes (48) Frozen Croissants £15 (31p each RRP £1) (£15 is less than normal wholesale price) I Could break into bags of 24 for £7.50 for any families. PLEASE TRY TO CONTACT WHOEVER YOU CAN OR MY FAMILY WILL BE LIVING ON THIS FOR THE NEXT 10 YEARS!!! 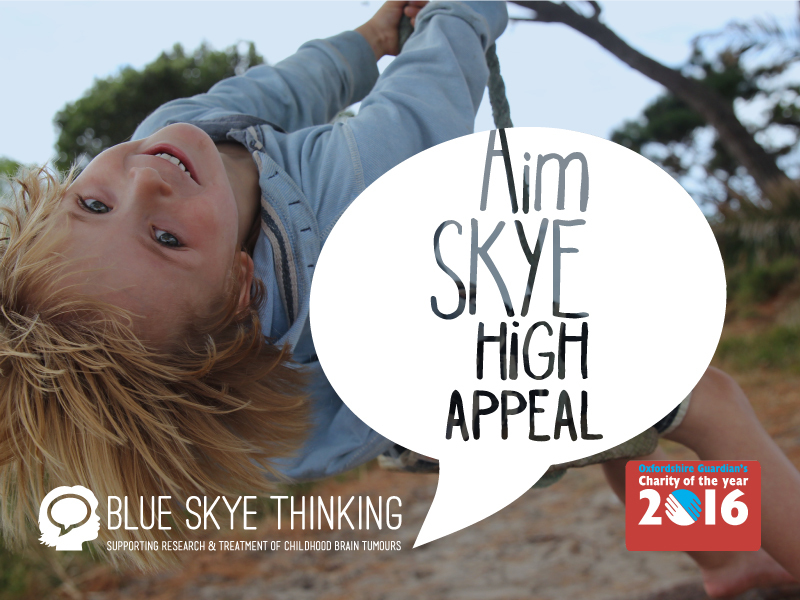 Today Blue Skye Thinking is launching a very special ‘Aim Skye High’ appeal to ensure we continue Skye’s legacy and help more children with cancer across the UK. Through our work supporting research and treatment of childhood brain tumours, we want to ensure that all children diagnosed, will have a better chance of survival and a better quality of life post-treatment. Our inspiration is Skye, a boy who refused to let the biggest cancer killer of children curb an incredible energy and imagination. His ambition to shoot for the moon drives us, and the groundbreaking research we're helping fund. Together we're bringing fresh thinking and great inventiveness to new and better treatments of childhood brain tumours and we need you, to support us in this mission. This mindset is at the heart of our fundraising. It started with Loom to the Moon and it’s continuing with Aim Skye High, our new fundraising initiative for 2016.
anything but. We're asking people to each think of a new and very different way to raise money, be it a few pounds or very many. We want people to Aim Skye High: your fundraising ideas should be a little crazy, a touch unconventional, and really original. It could be something that no one’s ever thought of or done before. Or it could be a new twist on an old favorite: hold a Garden Party inside or shave off half a beard. All we ask is that you add your creativity and inspiration. Why? Because it will demonstrate the power of blue sky thinking; because the more out of the box it is, the more talked about it will be; and because it’s exactly what Skye would have done. The campaign will run until April 2017. We’re hoping that more and more people find more and more inventive ways to raise money as the year progresses. And that the result is a snowball of originality, creativity and achievement, that benefits those who take part as much as our charity. Relapsed brain tumours carry the most devastating prognosis – fewer than 10% of children who relapse following current therapies will survive. We would like to fund a three year Post Doctoral research position at the renowned Northern Institute for Cancer Research, specialising in pioneering work on the biology of relapsed brain tumours in order to develop new targeted treatments. Having already raised £150k towards this new research project, we are already three quarters of the way to success, but need everyone’s help for the final push to raise the last £50k. There are lots of ways you can support our appeal. Help us with our in house fundraising events. Your skills are invaluable to us. From serving food at festivals to managing Instagram. WE need you! Many of you will know how hard I am finding it to leave the house at the moment. It is very difficult to acclimatise and know where one 'fits in' after witnessing such suffering and sadness. I want to strive to be a better person, not only building the Charity, but to allow Jesse and Flynn to lead a happy life. In so many ways I have come a long way since Skye died, but in others I am still processing everything that happened to him and miss him more now than ever before. I am fragile, lost and numb. My heart has been broken into so many pieces that it will take a very long time to be able to 'feel' again. At the moment, I am 'going through the motions' of life and that will just have to do for now. I feel very proud of myself for having plucked up the courage to go and see my friends at the Oxford Operatic Gala this weekend. This is the first non Charity, social event I have been to without having a panic attack. I have been so utterly touched by the warmth, generosity and unwavering love these amazing people have demonstrated towards myself and my family over the years and feel extremely lucky to have such deeply caring (and talented) friends. You may all be a bunch of 'lovies', but when the chips are down, you are like a family, "Who could ask for anything more"? The Gala was incredible and I had to record your last song as it moved me to tears. Never a truer word said (or sung). Thank you from the bottom of my heart for continuing to be there for all of us. Hope you will enjoy some of these memories we have shared together. I miss you! We promised a happy post and here it is. Yesterday proved, once again, to be an incredibly emotional day, but one that filled us all with a great deal of pride as we witnessed the unveiling of the newest addition to the Abingdon School Boat Club's fleet. When we were first contacted to say that the boys had decided to name the new boat after Skye, it was slightly overwhelming. Just a week before Skye's diagnosis, he and I had made a trip down to the Boat House to watch the boys training. He loved being on the water and to be able to follow the boys up and down the Thames on a launch brought him a great deal of joy. Back in 2012, we had also attended the Henley Royal Regatta Finals day together as a family to watch the Abingdon crew win the Princess Elizabeth Challenge Cup for the 2nd year running. Skye was on the bank chanting ABINGDON! It made him feel so proud to be part of the celebrations. Captain of Boats, Tom Digby, spoke about Skye and how he had inspired the boys throughout his illness and about their desire to remember and honour him. The Abingdon School Boat Club flag was then drawn back to reveal Skye's name and before the boys took it out onto the Thames, it was dowsed in the obligatory Champagne. I managed to hold my emotions in check (just), to thank the boys for their kindness, and that we as a family felt so humbled, grateful and privileged that Skye had been honoured in this way. Skye loved singing his favourite songs before bed. It is always a treasured time for any parent. Tonight, please kiss your children like it could be the last time you ever get to do it and you will have a glimpse into the world we live in every day. You will be enriched and your child will feel loved. Jesse, Mummy and Daddy miss you so much Skye - bedtime will never be the same without you. "I Feel lonely without Skye in my bedroom. I want to make a doll of Skye so we can take it in turns to take him to bed with us." The first ever Select Petitions Committee Report on the chosen topic of Brain Tumour Research, resulted in a packed public gallery and over 60 MPs debating in Parliament yesterday. The overwhelming message was that the number of life years lost to Brain Tumours are greater than any other cancer, yet the funding is pitifully low. Ministers were humbled and shocked at the enlightening information they gathered in preparation for this debate and that Brain Tumour Research is now well and truly in the public eye. I met some lovely parents today, all with desperate stories and I wish you all much love and strength. With the incidence of brain tumours on the rise, MPs Guy Opperman, Ian Stewart and Nicola Blackwood brought a fantastic level of clarity and understanding for the way forward for a despicable Cancer which claims more lives of children and young adults than any other. I am absolutely sure they will they continue to support us so that our children do not die in vain as we strive for better survival rates and a better quality of life post treatment. With the incidence of Brain Tumours on the rise and the shocking fact that despite it being the cancer that claims most life years lost, it remains pitifully underfunded. This is about to change! In Westminster Hall this Monday 18th April 4.30pm, there's a debate on the Petitions Committee report into the issues raised by e-petition 105560 which many of you signed, on funding for research into brain tumours, led by Helen Jones. The report found that brain tumours are the biggest cancer killer of children and people under 40, but that research into them has been underfunded for decades. As a result, the committee concludes, survival rates for brain tumours - unlike those for many other cancers - have improved very little in the last 30 years. It has taken brain tumour charities almost 15 years to reach this point. Let's not waste it now! If you know someone who has been affected by a brain tumour please ask your local MP to attend the debate in Westminster and if they can't, to sign the EDM 1082 http://www.parliament.uk/edm/2015-16/1082. We are not asking for the world, just that the distribution of cancer funding is apportioned appropriately. Skye died due to side effects, which were not able to be shared quickly and efficiently among paediatric consultants due to NO DATA COLLECTION SYSTEM for standard treatment protocols being in place in this country. He had the most common of all brain tumours. This is fundamental and must be addressed to prevent future deaths. We are supporting the Children's Cancer and Leukaemia Group (CCLG) in implementing a data collection system, but they will be requiring long term funding which should should come from Public Health England not from small charities struggling to make a difference. We will continue to play our part and fundraise, but we need to be met half way by the current Government. To watch the Petitions Committee discuss the initial report in Westminster on Monday 14 March, please follow the link to the Parliamentary TV coverage. Sorry for the political tone of this blog post but we live to improve the future for children who face death well before their time and simple measures such as a data collection system will go a long way to helping prevent future tragedies. Template Letter for your local MP. Feel free to use all or parts of this template letter to send to your local MP over the next few days / weeks. We love and thank you all for your continued interest and support for our family. Wish us luck for Monday! When a child dies, the attention is thrust upon the child no longer here, but what of the siblings left behind? When Skye was born, he developed into the perfect big brother he was destined to be. A natural leader, Skye was over the moon when he learned he was to become a brother at the age of 3, clearly stating he would "send a girl baby back". The whole family were overjoyed when baby Jesse arrived, a little brother for Skye to nurture, guide and love. As the two of them grew, the bond between them was palpable. Jesse would gurgle and laugh, beaming at almost anything Skye did and said. Skye lavished kisses and bear hugs on his best friend, always looking out for Jesse, and felt it his duty to supervise and moderate any unwanted attention from other children. As they became older, dressing the boys in the same outfit offered a way for other parents not to take too much notice if one was being overly exuberant with the other, by means of immediately enabling them to deduce they were siblings! Jesse, who has always taken the matter of 'fashion' very seriously, would wake and check to see what Skye was wearing so he could follow suit as best he could. The day when they were torn apart is a day never forgotten. After a morning playing superheroes on the climbing frame in the garden, Jesse stayed at home with Daddy while I took Skye for a hospital appointment to rule out why he had repeatedly been sick in the mornings. After a CAT scan, Skye, aged 4 years, was diagnosed with a brain tumour. He was admitted to hospital immediately and for the following year received numerous operations, chemo and radiotherapy to try and cure him. The loving safe home they once knew was taken from them and they were to spend the next year living, for the majority of the time, apart. Jesse used to adore his hospital visits but his cries would haunt the hospital corridors when it was time to leave and he asked repeatedly when Skye would be better. Although Skye became physically frail, he was mentally strong and used to live out his physical life through Jesse, watching him play and encouraging him to do things that he, as a paraplegic, could not. Jesse still takes off his shoes and socks whenever we go down to the south coast and runs on the beach saying he is "doing it for Skye". It was incredibly hard to witness, but fills me with such pride that these siblings developed such a strong bond in what was actually such a short time they had together. Towards the end of Skye's life, the treatment had made him a tetra paraplegic so was completely unable to feed himself and was back in nappies just at a time when his little baby brother was learning to use a potty. The tables had turned and now it was Jesse's turn to feed his brother and care for him as one would a newborn. Skye remained the hero to look up to, and carried an air of dignified authority to his very last day. Jesse, the dutiful soulmate sitting beside him on his bed playing a little pink ukulele, gently singing a self composed song about "Two brothers in a bed". The days, weeks and months following Skye's death were incredibly strange and confusing for Jesse, aged only 3 years. A book called 'The Invisible String' was one he wanted to read repeatedly, which is about how, no matter where we are, are all connected with invisible string which we can pull when we want to feel close to those we are not near physically. It is hard to know exactly what thoughts go through a young child's mind when they lose their sibling. They are the closest person to themselves in every way, so it must feel like losing part of your soul. Skye lives on in our household. A year and a half on, Jesse still talks about him every single day. This can take different forms, either from an imaginary conversation with Skye to the more extreme, adoption of Skye as a new persona. He has, on more than one occasion said "My name is Skye today and you need to do everything you did with Skye, with me. Then you won't miss Skye any more." Jesse is very able to socialising and adores other children. But while on holiday, he does comment that he would be having more fun if Skye were with him to play with, but then shows amazing empathy and continues to say "but it is more sad for Skye". Although Jesse is now to take the position on earth as the big brother, he does not consider himself so. When tiny Flynn began to cry in his little maternity cubical cot, Jesse, in alarm said, "Oh mummy, he's crying, I don't like him crying". I explained that because he couldn't talk yet, it was his way of trying to tell us something and asked Jesse what he thought that might be. He answered quite sincerely "I think he is crying because he knows he will never meet his big brother Skye." I was so excited and honoured to see Blue Skye Thinking has been nominated for the Oxfordshire Guardian's Charity of the Year Award, then I saw the other nominations and wanted them all to win! We hope Blue Skye Thinking will continue to fund much needed research into childhood brain tumours for years to come but as a Charity, this year will have been the most significant for us. It is the year we have had to go it alone without Skye here in person driving us. In his own words "Help doctors make other children better, even though they can't help me" will stay with us all forever. That will be our driving force! Thank you all for your continued support. PLEASE VOTE FOR BLUE SKYE THINKING - IT HAS BEEN AN EXCEPTIONAL YEAR FOR US! Thinking of all my lovely mummy friends coping with one less mother's day kiss today. Today, we are finally heading to London to have a much anticipated meeting with Mr Ashley Gamble, the Executive Director and Dr James Nicholson, the Chairman of the Children's Cancer and Leukaemia Group (CCLG). We are determined to move this from a unanimously agreed concept, to a tangible, fully functioning system. Watch this space…. Of all our blog posts - this is one of the most important yet. When you have 10 minutes, please take the time to read and digest. It has been incredibly difficult to see the way the media has portrayed the most recent Lancet Report on Proton Beam Therapy. Lets just be completely clear. This is not some magical treatment that will be the answer to all parent's prayers who have the unenviable task of making decisions how their child should be treated for brain tumours. Proton Therapy is still a radioactive treatment. While it is very good news that the UK will be having Proton Machines (and we should have had them a long time ago,) it is incredibly dangerous to place all brain tumours in the same bracket. Even the most common Medulloblastoma which Skye had, can be sub-categorised four times over and needs to be treated differently in order to strive for a cure. Paediatric Consultants in the UK do an exceptional job despite being hamstrung by many system related obstacles. Any parents finding themselves having to navigate their way through the world of childhood brain tumours should keep faith in their consultants, but certainly feel able to question and share in every decision that is made as these are decisions are ones that will remain with them for the rest of their lives. There are system failures, which need to be urgently addressed however. The system failures, need addressing as a matter of urgency. Children who are diagnosed with cancer in the UK are currently placed on one of two different treatment plans. One option is in the form of a Clinical Trial. Here there is a Chief Investigator who has an oversight of the entire Trial and in each Centre there is a Principal Investigator who has a responsibility to submit in writing any adverse events within 24 hours of their occurrence. If no Clinical Trial is open for a particular tumour type, the child is placed on a Standard Treatment Guideline Protocol where there is no such mechanism for feedback on treatment, and it simply relies on the diligence of the clinicians to share data with each other and that can take far too long during a critical time when children are fighting for their lives. The severity of this aspect of care can be illustrated using the example of the standard treatment Milan Protocol, which was billed to us as offering the best cure rate for our son Skye’s type of tumour. This protocol comprised of, amongst other treatments, twice daily (hyper-fractionated) radiotherapy and a high dose of Thiotepa chemotherapy. When we approached consultants from around the world including Dr Torunn Yock responsible for the most recently published Lancet Report and Dr Roger Packer, we were told that Proton Therapy could not be given twice daily and if we opted for Proton Therapy, we would not be able to follow the Milan Protocol. At this time, the Milan Protocol, devised from a single centre study, was presented to us as the UK’s standard guideline treatment due to it having superior cure rates to that of other protocols and therefore our decision was made based on the fact that opting for protons would not have allowed Skye the best possible chance of being cured. There had however been misgivings about the efficacy of the Milan Protocol for a lengthy period of time prior to Skye commencing treatment but we were not made aware of this. This is just one example of a number of standard treatment protocols for which there is no formalised data collection system currently in place in the UK where clinicians can immediately and reliably share information such as acute side effects and outcomes from treatment. The Milan Protocol was withdrawn from use in the UK after Skye’s diagnosis of chemoradio-neurotoxicity was flagged up by his consultant to other clinicians, but had there been a more robust systematic collection of data, discoveries and amendments could have be made much quicker. There was also a general feeling among clinicians, that because of the very nature of the accuracy of proton treatment, this may not prove as effective as conventional radiotherapy, thus having an impact on cure rates. It is yet to be determined if this will have significant impact on children who fall into the high-risk, metastatic medulloblastoma category. Your continued support is much appreciated as we address the Data Collection issue with the NHS and CCLG Chief Executives. We have been working behind the scenes on this with keys players and feel now is a good time to bring it into the public eye. It has been a while since I picked up a camera to take some 'arty' shots. I am thrilled to say that Flynn seems to have taken to life in front of a lens as well has his two big brothers. Having a baby in the house brings with it a sense of wonder of nature and the world we live in. Who cannot fail to smile back when a little innocent face grins up at you? I see Skye in Flynn's eyes and so many caring traits Jesse demonstrates towards his new brother. Our hearts are still so very heavy but our minds are full of the daily business we must attend to which helps get us through each day. Flynn’s birth has been a lifeline to us all but there is a term for bringing a child into the world, labour. There is no term for the pain watching them leave, a labour that lasts for eternity. A struggle every day to remember to breath between each contraction of the heart, a fleeting moment of respite before the next wave of agony controls your mind. I enjoy breast feeding the new man in my life, watching his little face and hearing his contended noises. Third time around, I am determined to ‘crack’ better sleeping habits. Skye and Jesse had snatched sleeps during the day as we dashed from one social engagement to another. I have two books by my bed, one on Gentle Sleep Solutions and the other on Mindfulness in Grief. Just like my moods I can lunge from one subject to another in an instant, especially during night time feeds when the house is silent and I have time for my mind to wander. The book on mindfulness grabbed my attention with an image. It is 'sky with bird', not just a bird. Seeing the sky and the bird with equal amount of attention, and no desire to change either one is mindfulness. The book goes on to explain that, if applied to grief skillfully, mindfulness allows us to observe the fullness of our experience: our heartache and love, fear and anger and our gratitude for the friend with the casserole, and whatever else shows up. Rather than fight against reality, we learn to embrace each moment mindfully. We have been fighting non-stop for the last two and a quarter years and we are tired. There are still things we will keep fighting for – a fomalised data collection system for children on standard cancer treatment protocols for one! Our communication with Oncologists and Politicians is ongoing. It is senseless and short sighted not to have a system in place for consultants who work round the clock to try and help our children, not to be able to formally share their experiences with standard treatments (good or bad). We will however try not to fight so hard with society. It is incredibly hard to feel in touch with people that live along side us knowing they will often only see the positive exterior we arm ourselves with when faced with work, charity events and school pick up. For Andrew and I, running the Charity is not a ‘feel good’ activity to give us focus, it is tiring being constantly positive and thankful, which we understand we need to do and of course genuinely are. There are many days we just want to give up but then someone sends an email or picks up the phone and says they have nominated Blue Skye Thinking for a charity event. Research is a hard ‘sell’ but what the medics need and in the words of Andrew’s hero, Nelson Mandela “There is no keener revelation of a society than the way in which it treats it's children.” With so much chaos in the world, LOVE and GENEROSITY are what will keep us all going.